This macro is great for sign makers with CorelDraw X8, to assist vinyl cutting or anyone who needs to duplicate shapes. The macro can quickly duplicate the selected shape to fit as many as possible tiled into your specified area. 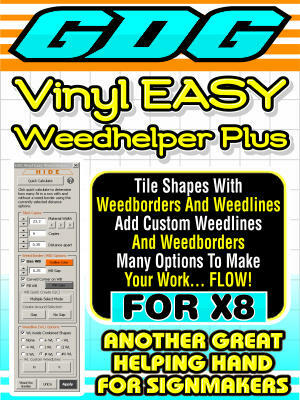 Many cool options include different 9 different weed border styles, rounded corners on weed borders, quick fit calculation, custom weed line placement, weed box maker, plus many other AWESOME features! Weed lines can also be placed inside combine shapes or not. Note: This version is for or X8 only.